Arnold Mack was a pioneer in growing and marketing the first seedless watermelon varieties. His first farming venture was growing watermelons in south Alabama in 1967. After a short stint in the family's funeral parlor business. As Arnold told it "We couldn't get 'em in the ground fast enough to grow the business, so we decided on a different approach -- getting 'em out of the ground. From there - it was up to us to grow the business." Arnold got wind of some land for sale in Lake Wales, FL -- and over the years the farm turned into a 3500 acre year-round operation. 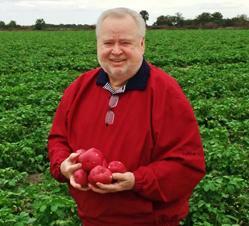 Mack Farms has two primary divisions: Potatoes and Watermelons. We grow, pack and distribute both crops from our wholly-owned farms and in partnership with our long-time friends. The potato division operates primarily under the River Gold label. We grow all varieties of new crop potatoes on two FL farms from February - June and distribute year-round. We operate the watermelon division under the McMelon brand. The melons are grown on several farms in FL, GA, AR and DE from May - November.